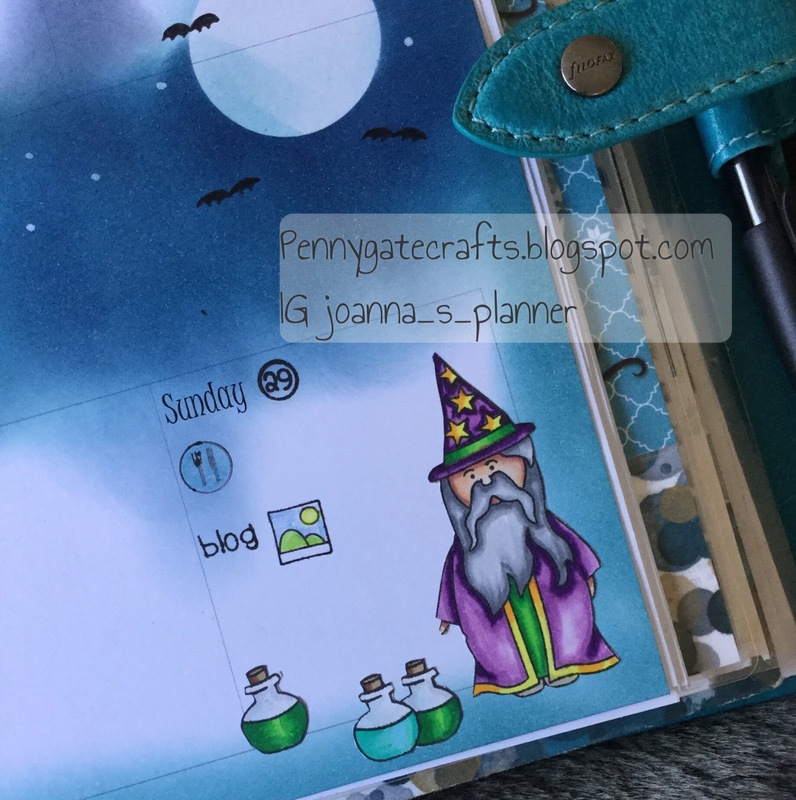 The end of January, beginning of February saw a couple of inky spreads. It is always good to try new techniques and new media, even when things go wrong. The first is the wizard spread from January. I had found this fabulous new set of Newtons Nook stamps, which are all magical and very `Harry Potter-ish`. The original plan was to create a scene in the middle of the right hand page. The spread was designed to allow for this. However, Once the moon had been masked and ink applied it was immediately obvious that this was going to end up being a bigger spread than originally planned. In order to balance the spread I extended the dark blue sponging around both the pages adding a little extra between Saturday and Sunday. 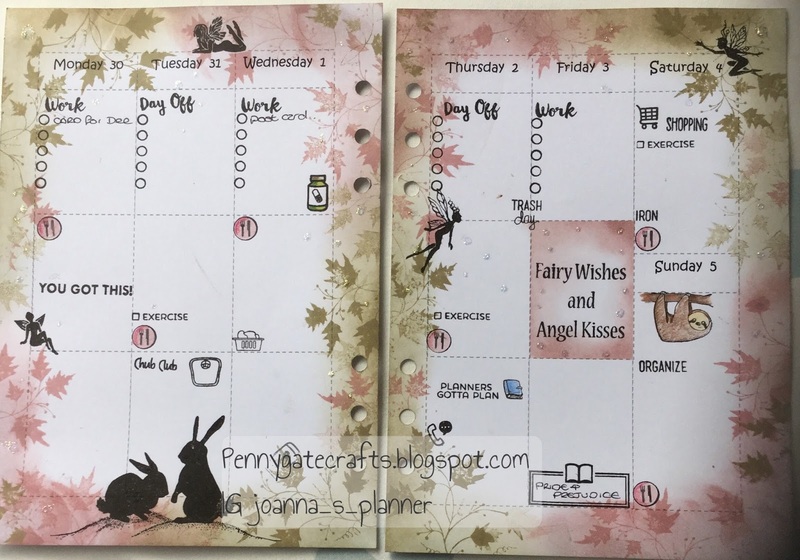 I didn`t want to ink up any extra at the beginning of the week as this is when my planner is at its busiest and space is at a premium. But, on reflection it may have made the spread look better....in fact I might just add that bit of ink in retrospect. The owl on the left page is from the same stamp set. The branch was hand cut into a piece of post-it pad to make another mask before inking in the negative space. 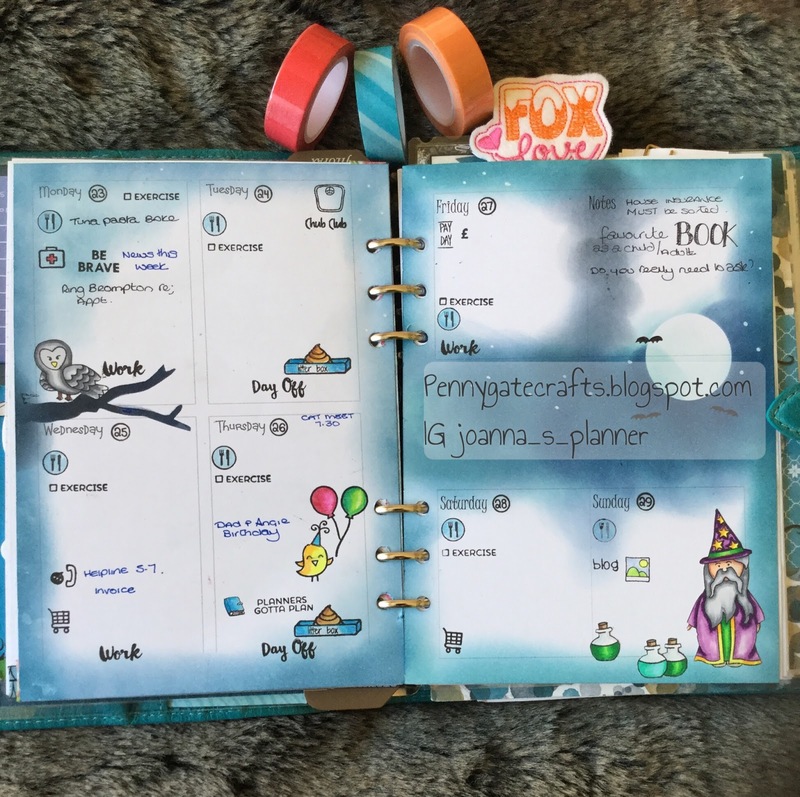 Stars were applied using a stampin` up chalk it marker and the bats were hand drawn using my planner pen...they were just added to bring the spread together and to add a little detail to the expanse of blue ink. 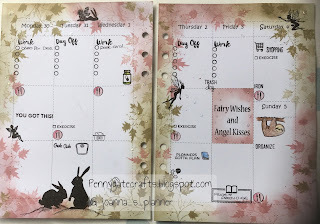 The inky mess on this spread was created using Stampin` Up Marina Mist and Night of Navy, they have worked really well. There was no strike through and only a few fingerprints made it to the following page. Now, in contrast to the wizard spread this magical scene was inked up using Distress Inks. To be honest I am not sure what I was thinking about. 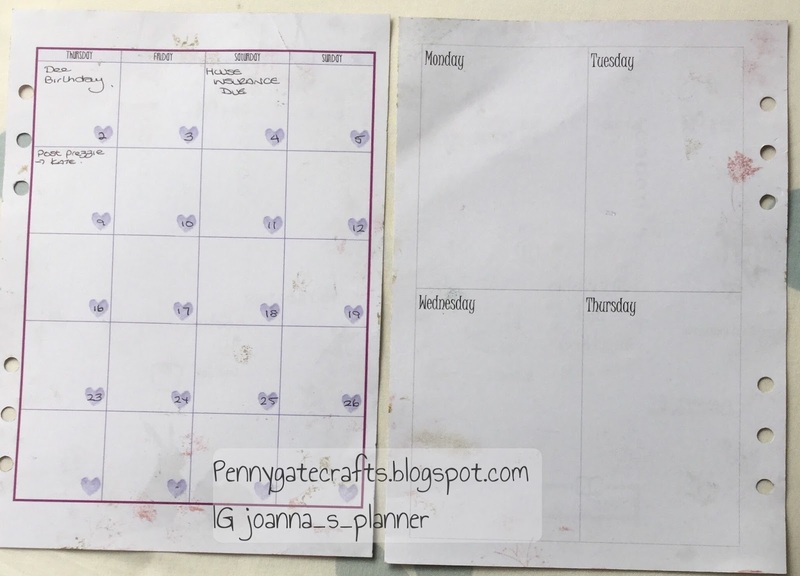 In the back of my mind I know distress inks are not good in my planner, but for some reason that piece of information was filed away in the recesses of my brain. I know I chose the brand because I love the vintage feel of the ink colours. Here I have settled on Pumice Stone and Victorian Velvet. These two colours were used both for the sponging around the edges and for the leaves that were stamped on top of the sponging. The square in the middle of the right page was masked off and also sponged with a sentiment added using Versafine, which is my go to ink for every thing. Those of you who are familiar with my spreads will be surprised to see a traditional vertical spread. It was kindly gifted to me by Karen on the Planner Stamping Facebook Page. I could say lots about this layout but I think a separate blog post on layouts might be more interesting. The decorative stamps on this spread are from Lavinia stamps...a UK company whose designs I love. They work really well with gelli plate printing but I haven`t got that adventurous in my planner yet. Little blobs of glitter were also applied to add to the magic look. In order to add insult to injury as far as my February monthly spread is concerned, senior cat LOKi (Little Orange Kitty) subsequently walked across the entire spread with wet paws. Those of you who are familar with the water reactive qualities of the distress inks can imagine the mess that is now my monthly spread!